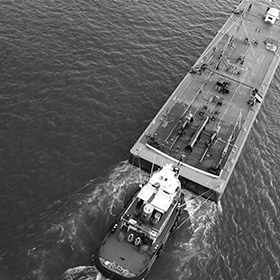 Barge Accidents | Jones Act | The Dysart Law Firm P.C. The Dysart Law Firm, P.C. and Christopher W. Dysart have represented hundreds of clients over the past two decades. If you or a family member or friend is a crew member on a towboat or barge, you understand how dangerous the jobs are and that you or your family member or friend is subject to serious injury while working on the inland rivers and waterways —injuries that could take away you or a family member or friends livelihood or permanently diminish the quality of life. Under the Jones Act, deckhands, first mates, mates, pilots, Captains and other seamen have certain legal rights that offer protection to the health and livelihood of workers that work on the inland waters and rivers of the United States and to other maritime employees. The act entitles them, or their surviving spouse or dependents, to file a lawsuit against their employer when their fellow crew members or ship owner’s negligence caused their injury or death. When a worker is injured working on the inland rivers and waterways, the results may be significant. In addition to suffering a serious or potentially life-threatening injury, the worker may face the added burden of trying to provide for his or her family while facing medical costs and lost wages. At our firm, we are dedicated to helping those who have suffered injury in any type of inland, river, or waterway accident or injury that is covered under the Jones Act or other maritime law. We have handled numerous Jones Act cases successfully for our clients and have the experience and success rate you need to be successful in your Jones Act Case. We can assist deckhands, fist mates, mates, pilots, Captains, cooks, seamen, longshoremen, and many others. If you suffered a serious injury, it is your right to seek compensation. If a loved one died while engaged in river or other marine operations you may also be able to file a claim. As an experienced Jones Act lawyer, Christopher Dysart can provide you with the experienced, compassionate support and guidance you need. he can represent workers along the inland waters and rivers of the United States. When you involve the Dysart Law Firm, P.C., you can feel confident that we will work to get you the compensation you deserve.